ZB-D series pipeline extrusion melt pump also called pipeline melt pump for extrusion. 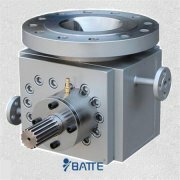 Batte pipeline extrusion pump is single stage single suction centrifugal pump with vertical structure, the extrusion pumps import and export in the same straight line and the same caliber and shaft centerline orthogonal for vertical pumps. 1. Pipeline extrusion pump improve stability dimensions: effectively isolate the die from the upstream pressure fluctuations, the extruded product dimensional tolerances to a minimum. 2. 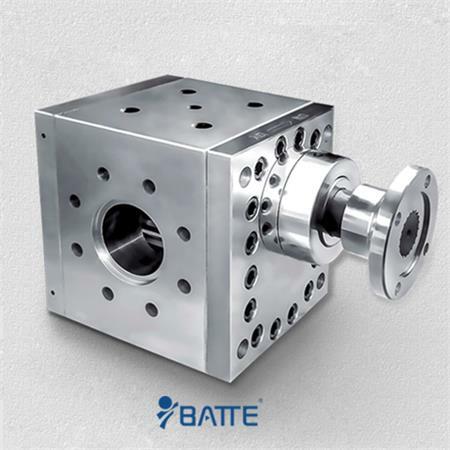 Melting quality control: Extruder back pressure regulator to reduce the residence time, stabilizing role in mastication, and lower the melting temperature. 3. 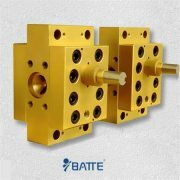 Increasing production: reduce the pressure on the screw of the requirements of the screw to the die pressure was changed from the original construction of the die melt pump to build pressure, high-speed and efficient extrusion screw, called for the establishment of pressure regardless of size, are providing very high effectiveness. 4. Reduce the use of raw materials: extruded final product finished size change is small, reduce waste and reduce scrap rates. 5. Fluctuations and the impact of the elimination of the screw: effectively solve the pressure due to the melt density or extruder parameters caused fluctuations. 6. 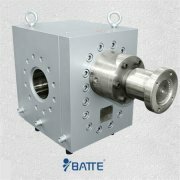 Enhance the extruder flexibility: pipeline melt pump for extrusion allows you to change the processing conditions, such as higher feed back the amount, temperature and pressure. 7. Reasonable handling and operation: pressure closed-loop control, PLC or only instruments. 8. Extend the life of the extruder: lower extrusion pressure extruder, reducing the intensity of the work of the extruder, can greatly slow down the wear of the screw and barrel, extending the life of the extruder. 9. Operating costs less: pipeline extrusion pump provide a more accurate delivery measurement, avoid waste materials.